Gareth Cook, the editor of Best American Infographics 2013, has put together a short but true summary of the history of information graphics. (Many of you who see this blog may know most of it already.) 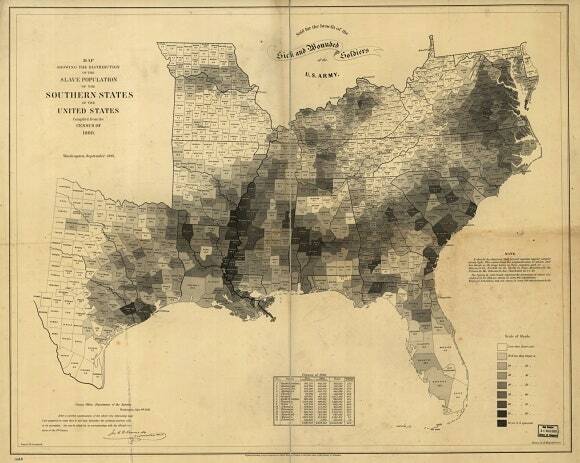 His striking lede recounts how much Abraham Lincoln valued his "slave map," shown above. Lincoln's reliance on the shades of gray throughout the Confederacy made an enormous difference in his Civil War decision-making. Fortunately it's rare that most people have to make life-or-death decisions — but even with our smaller concerns, this incident underscores how vital it is to have accurate, visually synthesized data as the basis for those choices. Imagine Lincoln trying to do this with nothing but columns of numbers.